The book is scheduled to be published on Monday, and Mr. Marable had been looking forward to leading a vigorous public discussion of his ideas. But on Friday Mr. Marable, 60, died in a hospital in New York as a result of medical problems he thought he had overcome. Officials at Viking, which is publishing the book, said he was able to look at it before he died. But as his health wavered, they were scrambling to delay interviews, including an appearance on the “Today” show in which his findings would have finally been aired. Manning Marable, whose long-awaited biography of Malcolm X, “Malcolm X: A Life of Reinvention,” will be published on Monday, died Friday. He was 60 years old. Marable, who had led African American studies at Columbia University, was a professor there with many titles. Officially, he was the M. Moran Weston and Black Alumni Council Professor of African-American Studies and professor of history and public affairs at Columbia University. Columbia also notes that he was founding director of African American studies at Columbia from 1993 to 2003 and since 2002, he directed Columbia’s Center for Contemporary Black History. As far back as 2005, Marable was talking about “Malcolm X: A Life of Reinvention.” In February of that year, on Malcolm X’s birthday, he told Democracy Now about the materials that he had seen that others had not, including three “missing” chapters from Malcolm’s autobiography that he said show the leader in a very different light. Back then, Marable had already been at work on the biography for a decade — meaning that he’d spent more than 15 years on the book and died just three days before its publication. “A Life of Reinvention” by Manning Marable will be published by Viking on Monday. 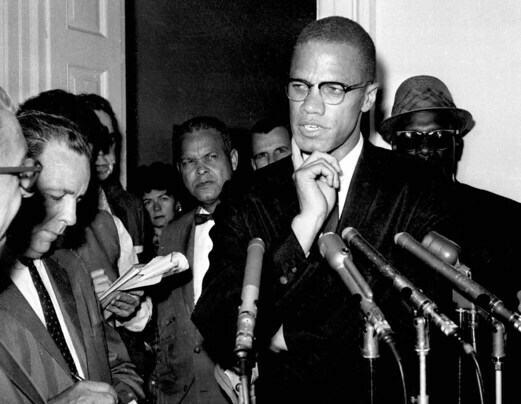 Associated Press/ – Malcolm X speaks to reporters in Washington in 1963. Forty-six years after Malcolm X predicted his own assassination, the question of who pulled the trigger remains unanswered among many scholars who study his life. A book out Monday resurrects the long-standing mystery and suggests that some of those responsible for the activist minister’s death have never been prosecuted.